For travelling, more on the go, you will want to check out on MacBook Air. However, if you are looking for a primary laptop, or more into your desktop replacement, than MacBook Pro is the perfect choice since it has better processor, better GPU and it has retina display. 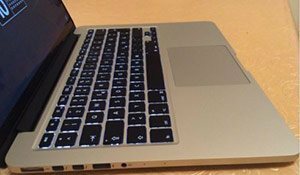 I purchase this Apple MacBook Pro MGX72LL/A, which is currently the baseline model of the 13″ Retina versions which has 128GB of SSD. Found it on best price here. This Apple MacBook Pro MGX72LL/A is the newest line of Mac Book Pros, which are thin, and light, that’s what you would expect in a MacBook Pro device. They didn’t include ethernet ports, CD/DVD drive, and the hard drive. Many people thought my MBP is an Air, just that thin. This laptop doesn’t have conventional HDD but solid state drive (SSD). While I wish it was a 1TB SSD, I won’t use any laptops that use conventional hard drive again. SSD laptops can boot just in “seconds”, it’s that fast. The laptop cost a bit higher than the Air, but it has more power. Battery life is great, and it runs really quiet. The Iris Graphics and the dual-core i5 suprisingly, handles all of my games well. Basic computing jobs, like iLife, music, and web browsing are smooth, and load fast. The 13.3″Retina display is just brilliant, best screen I’ve ever had. You’ll see big difference when you are streaming videos on a Retina display or in a standard screen. The text, videos, and photos are so rich in colors and clearer. The trackpad of this MacBook Pro speaks for itself, nothing beats it. It has glass surface, large, and you can use all of gestures that are practical and comfortable to use, it’s not made from plastic like on other laptops. It has the typical ports, on the left, there are MagSafe 2 power port, 2x Thunderbolt ports, 1x USB 3.0, headphone/mic combo. On the other side, there are SD card slot, HDMI port, 1x USB 3.0 port. Apple MacBook Pro MGX72LL/A 13.3-Inch Laptop with Retina Display (NEWEST VERSION) – Mavericks installed. For the right side ports pictures, view them here. While other brand laptops will give you warranty, they will likely ask you to get RMA, ship your laptop to the main factory that will likely need more than two weeks, and when you call you will be transferred a few times, Apple 1 year standard warranty is just the best. I recommend you to get an AppleCare or Square Trade warranty. Even though this laptop is a high quality machine, not everything is perfect. To me, it has one big drawback, the memory is soldered to its main board, which means, RAM isn’t upgradable. However, this model comes with 8GB of RAM which is more than adequate for my daily needs. Then, I wish Apple replaced the 2 Thunderbolt ports with another USB 3.0 since it has only 2 USB 3.0 ports. What I reallly love about having a Mac laptop is they are ready to use out of the box. You won’t need to spend your valuable hours just to remove the bloatware that came pre-installed, or installing anti virus software, nor do you have to spend hours to have 88 critical updates installed in your system. So basically, I am happy with this laptop, no exception. If beautifully designed, powerful, and fast laptop is what you want, get this. And Retina display is just something else, it’s hard to describe, something you must see yourself. You will not be disappointed. 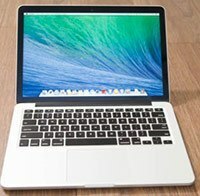 Which One To Choose MacBook Pro 128 or 256 GB SSD? → Next: Which One To Choose MacBook Pro 128 or 256 GB SSD?